Abstract: Carbapenemases are the most versatile family of β-lactamases which are capable of hydrolyzing virtually all β-lactam antibiotics including carbapenem, the last resort of treatment in the clinical settings to treat bacterial infection. 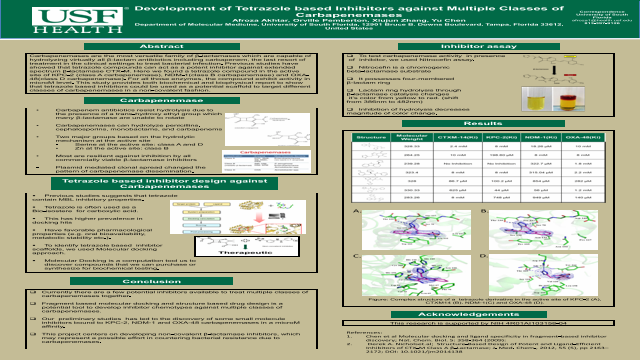 Previous studies have showed that tetrazole compounds can act as a potent inhibitor against extended spectrum β-lactamase CTX-M. Here we found a tetrazole compound in the active site of KPC-2 (class A carbapenemase), NDM-1(class B carbapenemase) and OXA-48(class D carbapenemase). For all those enzymes, the compound exhibit activity in microM level. This study provides both biochemical and biophysical report to show that tetrazole based inhibitors could be used as a potential scaffold to target different classes of carbapenemases in a non-covalent fashion. Summary: This project centers on developing non-covalent β-lactamase inhibitors, which may represent a possible effort in countering bacterial resistance due to carbapenemases.